In the first major test of how California voters would react to hydraulic fracturing on the ballot, two counties in California approved fracking bans on Tuesday. Opponents of fracking are hoping the movement will spread to other counties. But a measure to bar the controversial oil production technique in Santa Barbara County -- where the oil industry is well-established -- fell short. And in San Benito and Mendocino Counties, where the bans passed, they are likely to face court challenges. “It was incredibly exciting,” says organizer Andy Hsia-Coron, who rallied support for the San Benito fracking ban by raising environmental concerns, like possible risks to groundwater. The bans are pre-emptive. Currently, fracking doesn't occur in San Benito or Mendocino Counties. But both measures also ban a more common oil extraction technique where steam is injected underground to induce oil flow. While San Benito County’s oil industry is small, the change could be significant for the producers who work there, some of whom regard the law as a confiscation of property rights, also known as a "taking" in legal parlance. “It’s a regulatory taking because it’s the regulation which is depriving property owners of the ability to extract value from their minerals or property,” says Armen Nahabedian of Citadel Exploration, a company that’s developing an oil project in San Benito. “So it’s the duty of the county at this point to either allow people to continue to extract value from their property and not enforce the initiative or to compensate them accordingly with the fair market value of what they’ve been deprived of,” he says. The oil industry went all-out to head off a ban in Santa Barbara County, where oil production is a larger part of the local economy. The “No on P” campaign raised more than $7 million to defeat it, largely from the oil industry. The battles over fracking on the local level are far from over. 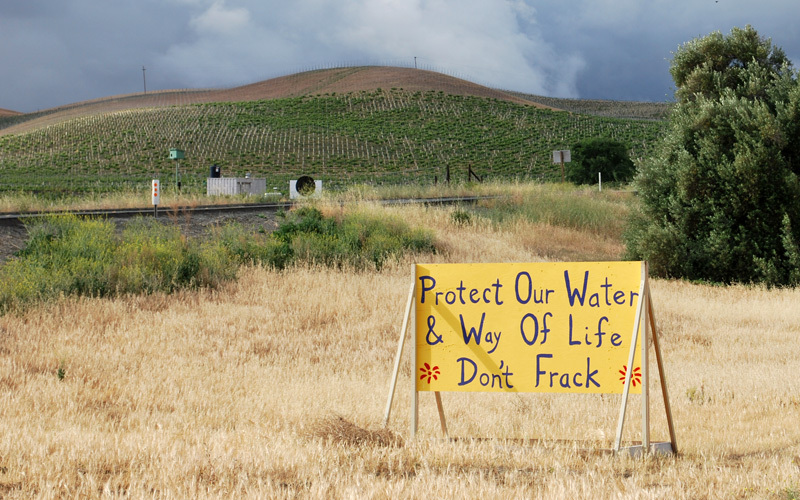 Butte County is set to vote on a fracking ban in 2016.